Once a rock quarry, the top of Bernal Hill now sports an antenna tower that appears to radio all dogs in the southern neighborhoods of the city to form a pack and roam free on the acres of grass and trails that blanket the hill. 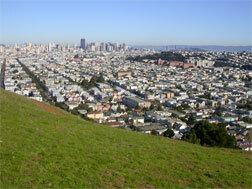 If you live around Bernal—and you own a dog—you know about this park. For those that don't live nearby, it's well worth a trip across town for its spectacular south views of the city and 39 acres of off-leash dog habitat. Set up camp on top of the hill and you can see the dogs file through all day—the early morning power-walkers with owners in tow, the mid-day motley packs with their professional dog walkers, and the evening strollers chasing balls and working the crowd. In fact this park is so friendly to descendants of the wolf that a wayward coyote has allegedly taken up residence on the hill. The fact that you’ll never see this coyote is testament to how big the park is. What Bernal Hill lacks in vegetation—it’s pretty much just grass with a few scattered trees and scrub brush—it makes up for with incredible panoramic views of the city. From the north side of the park you can see everything from the Marin headlands and the Golden Gate Bridge to the downtown skyline the Bay Bridges and the East Bay hills. Strategically placed benches offer welcome spots to rest and take in the view while your dog runs free. There are two main entrances to the park and a large paved path—a closed utility road—that connects them. Apart from the paved path, there’s a network of dirt trails that crisscross the hill. This is definitely one of those parks where both you and your dog can get some exercise hiking up and down the trails. Get to the lower entrance to the park by driving up Folsom street past Ripley where it heads up the hill and turns in to Bernal Heights Boulevard. Mid-way as you wind up the hill you’ll see a turn off on your right with a few parking spots and the park entrance. If this lot is full, which is very likely, keep going up Bernal Heights Boulevard circling around the park to your right until you get to the end of the road and the top entrance to the park. You’re likely to find plastic bags to pick up after your dog at both entrances to the park, but always bring your own and leave them behind if you have extras. As with all public dog parks in the city, it’s incumbent on dog owners to be responsible, respect the rules and help keep off-leash areas open and functional. See our “Dog Park Tips” page for more advice.